"I tend to ramble in interviews, so you'll never see a straight Q&A with me, because it doesn't work," says Regan Farquhar, a.k.a. Busdriver, steadfastly apologetic during our conversation. "I'm horrible. I've got a stammer, anyways." But it's just that - Busdriver's wordiness and rambling sensibility - that has made the Angelino native one of the rising MCs in the hip-hop business. His unmatched rapid-fire delivery trounces stoner MC synapses in one brief verse. He's a diction scrutineer, boasting pedantic rhyme qualities and a reckless cadence that runs circles around the average - and the above-average listener. And if you're keen enough to decipher a few lines of verse, you'll quickly realize it's because Busdriver's brain just works better than a majority of hip-hop's noggins. Busdriver got his launch at the famed Good Life Café during the mid-1990s in South Central L.A. and found his niche with the Project Blowed clique, under the wings of esteemed mentors Abstract Rude and Aceyalone. "Those are the people that pushed me to start recording," he says. "A lot of the older cats were really hands-on with me." Busdriver's creations have trickled past of the freeways of his locale, finding fans in locations as diverse as Vancouver, Tokyo, and Paris. "It's random, but we accept it," the affable MC says with a smile. Busdriver's fifth album (and his first on Epitaph) is RoadKillOvercoat, created over a "leisurely" eight months and featuring production by scene stars DJ Nobody and Boom Bip. 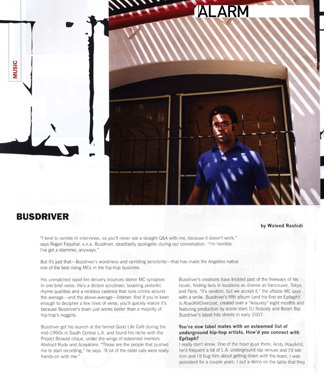 Busdriver's latest hits streets in early 2007. You're now label mates with an esteemed list of underground hip-hop artists. How'd you connect with Epitaph? I really don't know. One of the head guys there, Andy [Kaulkin], he'd frequent a lot of L.A. underground rap venues and I'd see him and I'd bug him about getting down with the team. I was persistent for a couple of years. I put a demo on the table that they liked and they kind of just went from there and decided to take me on, bravely enough. Do you really feel like you're a liability? I mean there's definitely a risk factor involved. I'm not the most popular of guys. I'm not particularly unpopular, but I'm definitely held in a certain regard as kind of the off-center, zany rap guy and that doesn't always pan out to great commercial success. But here I am! How'd you link up with Nobody? I've been a fan and in cahoots with Nobody for probably a little over 10 years. He produces some friends of mine back in the day, like Of Mexican Descent and old L.A. hip-hop groups from the heyday of L.A. underground rap. I've known Elvin (Nobody) for quite some time and have always been a fan of his work. I really wanted to do something that I didn't get on my last record, that I got on this record, and I really needed him and his sense of things to get it done. And I'm more than happy with what he did. I kind of knew him through the Mush thing, I'd seen him briefly at the Mush office, during Mush events and things like that, but never really developed a real personal relationship until we started working on this. 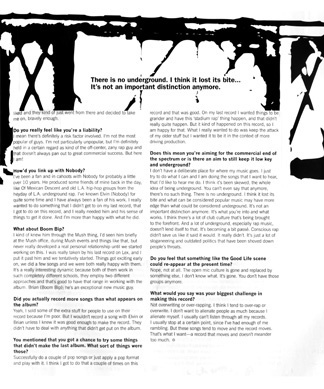 I was really taken with his last record on Lex, and I put it past him and we tentatively started. Things got exciting early on, we did a few songs and we were both really happy with them. It's a really interesting dynamic because both of them work in such completely different schools, they employ two different approaches and that's good to have that range in working with the album. Bryan (Boom Bip); he's an exceptional new music guy. Did you actually record more songs than what appears on the album? Yeah, I sold some of the extra stuff for people to use on their record because I'm poor. But I wouldn't record a song with Elvin or Bryan unless I knew it was good enough to make the record. They didn't have to deal with anything that didn't get put on the album. You mentioned that you got a chance to try some things what didn't make the last album. What sort of things were those? Successfully do a couple of pop songs or just apply a pop format and play with it. I think I got to do that a couple of times on this record and that was good. On my last record I wanted things to be grander and have this 'stadium rap' thing happen, and that didn't really quite happen. But it kind of happened on this record, so I am happy for that. What I really wanted to do was keep the attack of my older stuff but wanted it to be in the context of more driving production. Does this mean you're aiming for the commercial end of the spectrum or is there an aim to still keep it low key and underground? I don't have a deliberate place for where my music goes. I just try to do what I can and I am doing the songs that I want to hear, that I'd like to hear me do. I think it's been skewed, the whole idea of being underground. You can't even say that anymore, there's no such thing. There is no underground. I think it lost its bite and what can be considered popular music may have more edge than what could be considered underground. It's not an important distinction anymore. It's what you're into and what works. I think there's a lot of club culture that's being brought to the forefront. And a lot of underground, especially rap music, doesn't lend itself to that. It's becoming passé. Conscious rap didn't save us like it said it would. It really didn't. It's just a lot of sloganeering and outdated politics that have been shoved down people's throats. Do you feel that something like the Good Life scene could re-appear at the present time? Nope, not at all. The open mic culture is gone and replaced by something else, I don't know what. It's gone. You don't have those groups anymore. What would you say was your biggest challenge in making this record? Not overwriting or over-rapping. I think I tend to over-rap or overwrite. I don't want to alienate people as much because I alienate myself. I usually can't listen through all my records. I usually stop at t certain point, since I've had enough of me rambling. But these songs tend to move and the record moves. That's what I want - a record that moves and doesn't meaner too much.